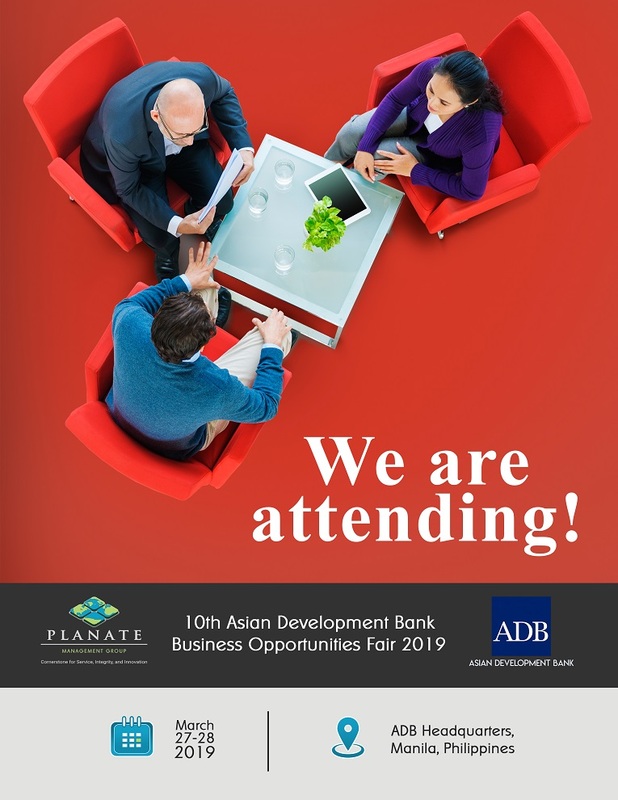 Planate is elated to be part of the 10th ADB Business Opportunities Fair 2019. See you there! Planate Management Group LLC (“we”, “us” and “our”) is a limited liability company registered in Virginia, the United States of America at 1800 Diagonal Road, Suite 600, Alexandria, Virginia 22314. References to “you” means any of our current or former visitors of our website (www.planate.net). By “processing”, we mean the collection, recording, storage, use, disclosure and any other form of operations or dealings with your Personal Data. During your visit to, browsing on, and communicating through our website, we may need to or automatically will gather and use “Personal Data” about you, by which we mean any information about you from which you can be identified. The purpose of this Privacy Notice (“Privacy Notice”) is to inform you of how we will process your Personal Data and the measures and processes we have put in place to ensure its adequate protection. This notice does not form part of your contract, and we may amend it from time to time. 4.	to comply with our legal obligations. We may also process certain Personal Data about you where you have given us your express consent to do so (which you may withdraw at any time, as detailed below). 2. Details of your access to our premises and to systems, software, websites, and applications including access and location data and communications data (information about devices used, IP (Internet protocol) address, device ID, application ID, vendor ID). We make every effort to maintain the accuracy and completeness of your Personal Data which we store and to ensure all of your Personal Data is up to date. However, you can assist us with this considerably by promptly contacting us if there are any changes to your Personal Data or if you become aware that we have inaccurate Personal Data relating to you. We will not be responsible for any losses arising from any inaccurate, inauthentic, deficient or incomplete Personal Data that you provide to us. While we do not provide any adult-only services, we do not store any Personal Data for persons who have not reached 18 years of age. Such Personal Data is either not obtained or, if obtained due to us not knowing that Personal Data is relating to a person below 18 – removed from our systems as soon as we become aware of the fact that Personal Data relates to a person below 18. We usually collect your Personal Data from the information you submit during the course of your relationship with us or our affiliate companies. This will typically be done when you agree to accept our marketing or information emails, apply for a job with us, join us as an employee, make any amendments to your personal details via our office intranet or by notifying us. 8.	as otherwise permitted or required by any applicable law or regulation. 5.	to any government, regulatory agency, enforcement or exchange body or court where we are required to do so by applicable law or regulation or at their request. We are committed to safeguarding and protecting Personal Data and will implement and maintain appropriate technical and organizational measures to ensure a level of security appropriate to protect any Personal Data provided to us from accidental or unlawful destruction, loss, alteration, unauthorized disclosure of, or access to Personal Data transmitted, stored or otherwise processed. We have implemented Information Security Policy to govern any relations regarding any information security measures. you can request this by emailing us at the address set out below, or by using website mechanisms, if such a present on the website. We endeavor to respond to such requests within reasonable time and will always respond within terms set by laws. In any of the situations listed above, we may request that you prove your identity by providing us with a copy of a valid means of identification for us to comply with our security obligations and to prevent unauthorized disclosure of data. We reserve the right to charge you a reasonable administrative fee for any manifestly unfounded or excessive requests concerning your access to your Personal Data, and for any additional copies of the Personal Data you request from us. We will only retain your Personal Data for as long as necessary to fulfill the purpose for which it was collected or to comply with legal, regulatory or internal policy requirements. We may change or update parts of this Privacy Notice in order to maintain our compliance with applicable law and regulation or following an update to our internal practices. We will do this by updating this Privacy Notice on the Planate website. You will not necessarily be directly notified of such a change. Therefore, please ensure that you regularly check this Privacy Notice so you are fully aware of any changes or updates. Planate Management Group LLC ("we", "us" and "our") is a limited liability company registered in Virginia, the United States of America at 1800 Diagonal Road, Suite 600, Alexandria, Virginia 22314. References to "you" means any of our current or former visitors of our website (www.planate.net). By "processing", we mean the collection, recording, storage, use, disclosure and any other form of operations or dealings with your Personal Data. During your visit to, browsing on, and communicating through our website, we may need to or automatically will gather and use "Personal Data" about you, by which we mean any information about you from which you can be identified. The purpose of this Privacy Notice ("Privacy Notice") is to inform you of how we will process your Personal Data and the measures and processes we have put in place to ensure its adequate protection. – based in the European Economic Area ("EEA") or based outside the EEA but where your Personal Data (as defined below) is processed in the context of any of our establishments in the EEA. References to "you" will also include, where relevant, any dependents or other individuals about whom you provide Personal Data in connection with your relationship with us for visitor/client/customer/employee/contractor management reasons, such as for emergency contact or benefit purposes. We are a "controller" for the purposes of the General Data Protection Regulation 2016/679 ("GDPR"). We are committed to protecting your privacy and processing your Personal Data fairly and lawfully in compliance with the GDPR. Privacy Notice ("Privacy Notice") is to inform you of how we will process your Personal Data and the measures and processes we have put in place to ensure its adequate protection. 5.	to comply with our legal obligations. We may also process certain Personal Data about you where you have given us your express consent to do so (which you may withdraw at any time, as detailed at clause 9 below). 5. Details of your access to our premises and to systems, software, websites, and applications including access and location data and communications data (information about devices used, IP (Internet Protocol) address, device ID, application ID, vendor ID). We make every effort to maintain the accuracy and completeness of your Personal Data which we store and to ensure all of your Personal Data is up to date. However, you can assist us with this considerably by promptly contacting us if there are any changes to your Personal Data or if you become aware that we have inaccurate Personal Data relating to you (see clause 9 below). We will not be responsible for any losses arising from any inaccurate, inauthentic, deficient or incomplete Personal Data that you provide to us. accept our marketing or information emails, apply for a job with us, join us as an employee, make any amendments to your personal details via our office intranet or by notifying us. 10.	as otherwise permitted or required by any applicable law or regulation. The Personal Data we collect in connection with your employment or engagement with us may be transferred to (including accessed in or stored in) a country or territory outside the ("EEA"), including to countries whose laws may not offer the same level of protection of Personal Data as are enjoyed within the EEA. We will ensure that any such international transfers are made subject to appropriate or suitable safeguards as required by the GDPR. Copies of the relevant safeguard documents are available by contacting us at the details provided below. 7.	to any government, regulatory agency, enforcement or exchange body or court where we are required to do so by applicable law or regulation or at their request. 7. The right to object – you are entitled to object to your Personal Data being used without your consent. 8. The right not to be subjected to automated decision making and profiling – you have the right to demand human intervention, rather than having important decisions made solely by algorithm. you can request this by emailing us at the address set out in clause 12 below. We endeavor to respond to such requests within a month or less, although we reserve the right to extend this period for complex requests. You are entitled to lodge a complaint with your data protection regulator if you consider that we have breached your data protection rights. Our cookies are stored and saved on your Terminal Equipment for a term set up by the respective cookies provider. We do not have any control over such term. These kind of cookies allow us to retarget our Website's users, whenever they browse any website within the ads network. This is used to market our products and services when users are searching or visiting other websites by displaying an advert for specific Planate's products. The different types of Marketing Cookies are not mandatory and the Website can operate without them, therefore, you are allowed to opt-in or opt-out at any time. At this point we do not use any Marketing Cookies Providers on the Website. In order to collect data on the usage of the Website and visits to the Website, Planate uses third party software. These providers store a permanent cookie (Performance cookies) on your Terminal Equipment which is subsequently used to register your use of the Website. This data is then analyzed by these third parties and the results are presented to Planate. This enables Planate to get insights in the way in which the Website is used and, based on this information, to make adjustments to the Website or the provided services. This kind of software can give this information to other third parties if it is legally obligated to do so and/or if those third parties are processing the information on behalf of these providers. These providers cannot use the information for any other purpose. You, as a user, can opt-in or opt-out from Performance cookies. Apart from Strict Cookies, some software we use in this website, from third parties, can store cookies (Functional Cookies) on your Terminal Equipment throughout our website. This paragraph applies to these Functional Cookies that provide functionality in our website. Planate cannot control or influence the use of Functional Cookies and/or the use by third parties of the information collected through Functional Cookies. Planate only provides the platform that enables storing these third party cookies. Planate emphasizes that on the use of the data collected through Functional Cookies further conditions of third parties may be applicable. The different types of Functional Cookies are not mandatory and the Website can operate without them, therefore, you are allowed to opt-in or opt-out at any time. At this point we do not use any Functional Cookies on the Website.